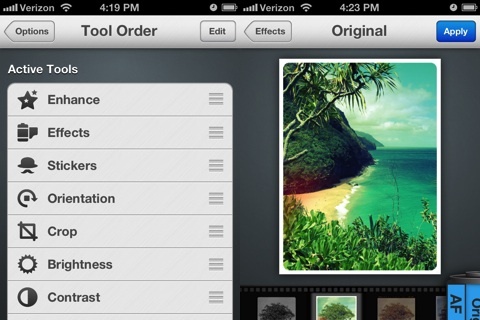 Photo Editor by Aviary simplifies sophisticated photo editing and enhancement tools in its successful and effective iPhone app. Its superb navigation, intuitive gesture controls, and lightning fast processing speeds make it a go-to iOS photo editing app for photography geeks, novices, and everyone in-between. The Photo Editor by Aviary home screen is amazingly clear and well-labeled. When you allow location services, your photo stream is immediately uploaded with your most recent photo filling the middle of the screen. You can access other photos with responsive finger swipes. There is no need for the twirling update icon, as your photo stream is available in the blink of an eye. At the bottom of the screen there are three icons from which to choose–in-app camera, editing tools, and photos. The photo editing tool navigation in the Photo Editor by Aviary app is nothing short of impressive. There is a menu bar at the bottom of the screen, and there are icons with descriptions of functions. When you swipe the menu bar of photo editing tools, you can select from five at a time on the first two swipes and four on the third swipe. You can keep track of where you are by monitoring the empty circle that fills with blue as you swipe your finger. You know exactly where you are in the Photo Editor by Aviary iPhone app, and you can select as many tools or as few as you want. Many photo editing iOS apps can bog you down by requiring you to move from one feature to another feature that doesn’t interest you. You can customize your photo editing tool bar by disabling unwanted ones in settings as well. The gesture controls to execute the photo editing tools are extremely accurate, intuitive, and responsive. The impact of the well-designed tools, as well as the ability to select preferred tools, increases the speed of the editing process as well. When you want to enhance the photo with light adjustment or add effects, you simply touch the screen on the appropriate icon. There are twelve effects currently available for free, and I found the free selections’ quality to be above average. You can purchase packages of additional effects in the app for $.99. When you place stickers, text, or draw on the photo, you can place them in the preferred location by dragging your finger and sizing with pinches. To adjust brightness, contrast, saturation, and sharpness, you move your finger horizontally across an adjustment dial. 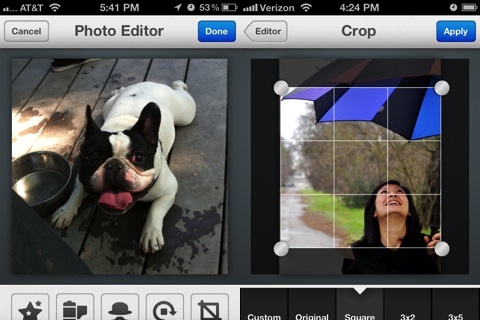 To crop a photo, there are several built-in, one-touch settings for common sizes. You can finesse the cropping by adjusting the corners or dragging the highlighted crop box to the preferred place on the screen. To correct redeye, whiten, and touch up blemishes, you select the size of a circle comparable to the size you want to adjust, then move the circle on the screen. An added feature is the ability to zoom in on a particular area, so you can precisely adjust an image. The Photo Editor by Aviary iPhone app saves your new photo to your camera library, but, unfortunately, it does not accommodate sharing to Facebook and Twitter. This is an iOS app attempting to streamline a challenging task, and that clear commitment and level of success should be applauded with a download from the iTunes App Store. AppSafari review of Photo Editor by Aviary was written by Jenni Ward on July 10th, 2012 and categorized under App Store, Featured, Free, Photos, Video. Page viewed 6096 times, 2 so far today. Need help on using these apps? Please read the Help Page.